The Niehaus Pedigree Chart below begins with my father, Frank J. Niehaus, Indianapolis, Indiana, and works back four generations to his great, great grandparents, in Westfalen, Germany. The surnames within those four generations so far in my research are Albers, Beerman, Gabe, Kamp, Krause, Marsischky, Mischky, Niehaus, Niehues, Siegbert, Wilmsen. Please click on the title below to see that pedigree chart. Note: Source documentation will be provided upon request. See my Contact Me form below. Josef Niehues and Maria Anna Beerman married in Riesenbeck, Westfalen, Germany on 10 October 1847. Maria Anna's parents, Gerhard Heinrich Beerman and Anna Margaretha Siegbert, lived in Bergeshovede, a town just on the outskirts of Riesenbeck. Josef and Maria Anna (Beerman) Niehues had three sons. Two of the three emigrated to the United States in the 1880s. Their surname in Germany was spelled Niehues. But in the United States became Niehaus. There is a considerable contingent of the Niehaus/Beerman/Wilmsen descendants living in Indianapolis, Indiana and beyond. You will find their descendants by clicking on the link at the top of this paragraph. John Niehaus, born in Indianapolis, Indiana, on July 4, 1889, was the 10th child of Joseph and Gertrude (Wilmsen) Niehaus. Go to the link just above this paragraph for a list of five generations of those that descended from him. Did you find yourself or a close relative? Have any updates for me? If you have questions or connections, please contact me. Elizabeth Gertrude Wilmsen was born to Gerhard and Elizabeth (Kamp) Wilmsen on 16 December 1847. At 35 years of age she emigrated from her home in Emsdetten, Germany, to Indianapolis, Indiana with her husband, Joseph Niehaus. The above link spells out the descendant story of her parents. Further information on Gertrude is in my story at the indianaties blog. Click here. Carl Mischky and Carrie Gabe are thought to be from Pomerania, a region of Prussia. They lived approximately 1820 - 1900. The family history for these great grandparents is still being developed. But there are records of many of their descendants, beginning with their daughter Carolina Mischky who married Wilhelm Marsischky in about 1875, before they emigrated to America. Click on the link to the report above to follow their descendants. Charles and Martha are buried side-by-side in Crown Hill Cemetery, Indianapolis. Charles Albers, (Nancy's great grandfather) was born in Germany in 1865 and immigrated into the United States in 1884. I do not know much yet about Charles' parents, except that his father's name was Julius. Charles Albers and Martha Marsischky married in Indianapolis in 1892. Nancy's line continued through their daughter, Louise Albers who married John Niehaus in 1911 in Sacred Heart Catholic Church in Indianapolis, Indiana. Click on the list above, just under the Albers name, to see four generations of Charles and Martha's descendants. Louise Albers Niehaus, my paternal grandmother, was a young mother of four at 25 years of age when the flu epidemic of 1918 took her. This report capsulizes her descendants, separately from her siblings that are included in the the list of descendants of Charles and Martha Albers above. I am glad to share the documentation for the above family history or discuss further information from my family research. You may get in touch with me using the form below or my email address is: nancyhurley1 at gmail.com. The Weber Pedigree Chart below begins with my mother, Rosemary Ethel Weber, Indianapolis, Indiana, and works back five generations to her great, great, great grandparents in Hugstetten, Baden, Germany. The surnames that are known to me so far in these five generations are Albrecht, Birkenstock, Grunsst, Hermann, Keen, Kuhn, Kraut, Leppert, Micol, Risch, Weber, Weiss. Please click on the title below to see the ancestry. If you find a possible family connection and would like to receive my documentation, I will be happy to provide it. Martin and Katherine (Birkenstock) Kuhn emigrated from Neustadt, Kurhessen, Germany in 1862 with six of their nine children. The Kuhn family made their home in Connersville, Indiana, for a about ten years, except for the eldest son, Gottfried. After Martin died in 1873 some family members moved from Connersville to Indianapolis, including Charles A. Kuhn (Nancy's great grandfather.) Charles A. Kuhn and Mary Anna Risch married in Sacred Heart Catholic Church in Indianapolis in 1879. Nancy's line is through their daughter, Otillia Katherine Kuhn who married Harry Lawrence Weber in 1913. Click on the Kuhn descendants link above to see the Martin and Katherine Kuhn line for four generations. My sources are available upon request. Just ask. The Family Group Report for Martin and Katherine (Birkenstock) Kuhn's family includes the details available for these two people and all of their nine children. Such as, the birth dates and places and many specifics of their lives that are in the censuses. Click on the above heading to read more about them. The descendant report above begins with my 3rd great grandparents, Adam and Katharina (Grunsst) Weber. My family background on them is still quite limited. If you recognize a possible family connection here, send me any information you have. The Grunsst name is in question itself. Other possible spellings are Gunsst and Grunst. For now, I know that Adam and Katharina are the parents of Adam Weber, who immigrated to the United States around 1857, with his wife, Amelia Micol. (Or possibly they came separately.) At the time that Adam and Amelia married in Vilbel, Germany, in 1856, the elder Adam Weber was a sheepherder in Altenstadt. If you would like to read a short story about Adam and Amelia, go here. The five-generation Weber/Grunsst descendant report is available through the link at the top of this paragraph. I will be happy to provide further information, including sources. This ancestry story of the Keen/Kraut line begins with Lawrence and Elizabeth (Kraut) Keen who began their married life in Zanesville, Ohio, in approximate 1846; at least that is where eight of their nine children were born. I am still searching for their marriage record. There's a possibility they married in Baltimore, MD, before making their way to Ohio. After about 20 years in Zanesville, the Keen family, including eight children, moved to Indianapolis. Hence, one of these siblings, Mary Anna Keen, married Harry Adam Weber, and the descendency traces from their union. Click on the link above for the list of several generations. Harry Weber (Standing at the back) was one of 11 children of Harry Adam and Mary Anna (Keen) Weber. Tillie Kuhn (not pictured) was one of seven children of Charles A. and Mary Anna (Risch) Kuhn. These ancestors are a part of the pedigree chart above. 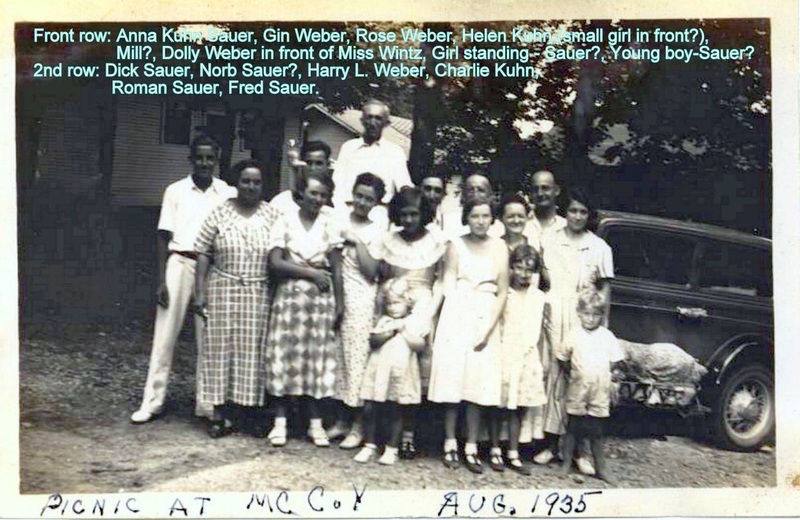 Otillia Kuhn Weber, Tillie, lived her 74 years on the south side of Indianapolis. She grew up with her five sisters and one brother in their home on High Street. My maternal grandmother, Tillie, is also a part of my "Ladies In My Line" series on the blog. You can read a short story about her at this link. The above Descendants list provides information on those of us who are carrying on her genealogy. The report above provides seven generations of the descendants of John Leppert who emigrated from Bavaria to Dearborn County, Indiana, in 1836. Through John's daughter, Julianna Leppert Risch, and her daughter, Mary Anna Risch Kuhn, the Kuhn/Weber family in Indianapolis can trace their origins to the farmers of southeastern Indiana and back to Bavaria. Joseph Risch and Barbara Oberietor were married in the Catholic church in Hugstetten, Baden on September 14, 1710. They became the parents of ten children between 1711 and 1730. Their grandson, Mathias Risch, Sr., married Maria Weiss in Hugstetten and later emigrated to America. The above report lists the descendants of Joseph and Barbara.. This is a story of Maria Hermann and Mathias Weiss. They were married in Buchen, Baden, Germany in 1811 and made their home in Hugstetten, Baden. One of their daughters, Maria Weiss, married Mathias Risch, Sr., and emigrated to America. Click on the report above for Weiss Hermann family information. If you can add to this particular family history segment, let me know by email: nancyhurley1 at gmail dot com. Thanks for taking the time to visit.